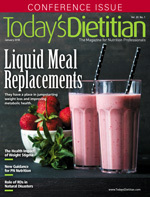 What the research says may change the way some dietitians counsel patients. "What are the best anti-inflammatory foods to help reduce my risk of cancer?" As dietitians, you've probably heard this question from clients. Unfortunately, clients often read articles or see headlines based on single laboratory studies that don't directly translate to evidence-based actionable advice. However, it's the RD's job to help them view anti-inflammatory eating within the big picture of inflammation and cancer risk. Chronic inflammation plays a role in the development of several chronic diseases. Studies link elevated biomarkers of inflammation to cancer and identify several mechanisms that may be responsible. • Some cancers are associated with local inflammation. Examples include cancers of the stomach (Helicobacter pylori infection), liver (hepatitis B and C infections), esophagus (Barrett's esophagus and reflux esophagitis), and colon (ulcerative colitis and Crohn's disease). Many factors can lead to chronic low-grade inflammation, and diet offers multiple potential approaches to reduce it. Small effects from a wide range of vegetables, fruits, whole grains, legumes, nuts, tea, coffee, and spices could add up, and perhaps even act synergistically to provide anti-inflammatory benefits. But working from the perspective of evidence-based practice, dietitians must be clear that current evidence shows potential, not promises, from these foods commonly labeled "anti-inflammatory." Foods that support health-protective gut bacteria provide other sources of anti-inflammatory cancer protection.8 According to Johanna Lampe, PhD, RD, of Fred Hutchinson Cancer Research Center in Seattle, prebiotics promote growth of gut microbes that may offer protective effects within the colon and perhaps with broader effects on cancer risk. Foods with inulin, inulin-type fructans, and other carbohydrates with demonstrated prebiotic effects include pulses (dried beans, dried peas, chickpeas, and lentils); onions, garlic, and leeks; and both Jerusalem and globe artichokes. In addition, as gut microbes break down certain other carbohydrates, they produce butyrate and other short-chain fatty acids that nurture cells lining the colon. Butyrate is also a signaling molecule showing protective effects in cancer pathways.8 Foods with fermentable dietary fiber, resistant starch, and beta-glucans that microbes use to produce short-chain fatty acids include pulses, oats, barley, mushrooms, and sorbitol-containing fruits such as apples, pears, raisins, peaches, and plums. Dietary fiber may act through anti-inflammatory and other mechanisms to reduce cancer risk. Lampe says dietary fiber that's more soluble and more easily fermented has been shown to reduce colon cancer development in animal models, though it's less clear whether this specific effect holds up in relation to colorectal cancer in humans. For people with overweight or obesity, even a 5% to 10% reduction in weight, especially when achieved through a combination of diet and exercise, is enough to reduce inflammation biomarkers.12,13 Moreover, emerging evidence suggests that anti-inflammatory effects may start with a change in the balance of calorie consumption compared with calories expended in activity. If substantiated, that would mean each day of more healthful habits could produce benefits even before resulting in weight loss. Just as for other aspects of health, overall dietary pattern is likely the best focus for messages about anti-inflammatory diets to reduce cancer risk. This encourages consuming an abundance of foods with potential protection and limiting foods that may have net proinflammatory effects. Studies suggest that excessive amounts of red and processed meats, refined grains, and sugar-sweetened beverages may act through a variety of mechanisms to increase inflammation. Although metrics such as the DII and EDIP are valuable as ways to assess dietary questionnaires in research studies on inflammation and disease risk, they aren't practical tools intended for clinical use by dietitians. Studies suggest three important bottom-line talking points for messages about anti-inflammatory diets and lowering cancer risk. • In virtually all studies, the association of diet quality and inflammation biomarkers becomes weaker when researchers adjust for weight (as BMI). This reflects the significant influence excess body fat has in promoting inflammation. Therefore, an eating pattern that emphasizes foods with anti-inflammatory potential will be most effective in reducing inflammation and lowering cancer risk when it also supports a healthy weight. 1. Elinay E, Nowarski R, Thaiss CA, Hu B, Jin C, Flavell RA. Inflammation-induced cancer: crosstalk between tumours, immune cells and microorganisms. Nat Rev Cancer. 2013;13(11):759-771. 2. Li W, Guo Y, Zhang C, et al. Dietary phytochemicals and cancer chemoprevention: a perspective on oxidative stress, inflammation, and epigenetics. Chem Res Toxicol. 2016;29(12):2071-2095. 3. Natural medicines. Therapeutic Research Center website. https://naturalmedicines.therapeuticresearch.com. Updated October 26, 2017. Accessed November 7, 2017. 4. Tayyem RF, Heath DD, Al-Delaimy WK, Rock CL. Curcumin content of turmeric and curry powders. Nutr Cancer. 2006;55(2):126-131. 5. Gantait A, Barman T, Mukherjee PK. Validated method for estimation of curcumin in turmeric powder. Indian J Trad Knowledge. 2011;10(2):247-250. 6. US Department of Agriculture. National Nutrient Database for Standard Reference, Release 28. http://ndb.nal.usda.gov. Updated May 17, 2016. Accessed November 7, 2017. 7. Karimi N, Dabidi Roshan V, Fathi Bayatiyani Z. Individually and combined water-based exercise with ginger supplement, on systemic inflammation and metabolic syndrome indices, among the obese women with breast neoplasms. Iran J Cancer Prev. 2015;8(6):e3856. 8. Bultman SJ. The microbiome and its potential as a cancer preventive intervention. Semin Oncol. 2016;43(1):97-106. 9. Wang DD, Hu FB. Dietary fat and risk of cardiovascular disease: recent controversies and advances. Ann Rev Nutr. 2017;37:423-446. 10. Iyengar NM, Gucalp A, Dannenberg AJ, Hudis CA. Obesity and cancer mechanisms: tumor microenvironment and inflammation. J Clin Oncol. 2016;34(35):4270-4276. 11. Doerstling SS, O'Flanagan CH, Hursting SD. Obesity and cancer metabolism: a perspective on interacting tumor-intrinsic and extrinsic factors. Front Oncol. 2017;7:216. 12. Imayama I, Ulrich CM, Alfano CM, et al. Effects of a caloric restriction weight loss diet and exercise on inflammatory biomarkers in overweight/obese postmenopausal women: a randomized controlled trial. Cancer Res. 2012;72(9):2314-2326. 13. van Gemert WA, May AM, Schuit AJ, Oosterhof BY, Peeters PH, Monninkhof EM. Effect of weight loss with or without exercise on inflammatory markers and adipokines in postmenopausal women: the SHAPE-2 trial, a randomized controlled trial. Cancer Epidemiol Biomarkers Prev. 2016;25:799-806. 14. Fowler ME, Akinyemiju TF. Meta-analysis of the association between dietary inflammatory index (DII) and cancer outcomes. Int J Cancer. 2017;141(11):2215-2227. 15. Tabung FK, Smith-Warner SA, Chavarro JE, et al. An empirical dietary inflammatory pattern score enhances prediction of circulating inflammatory biomarkers in adults. J Nutr. 2017;147(8):1567-1577. 16. Liu L, Nishihara R, Qian ZR, et al. Association between inflammatory diet pattern and risk of colorectal carcinoma subtypes classified by immune responses to tumor. Gastroenterology. 2017;153(6):1517-1530.e14. 17. Wirth MD, Hébert JR, Shivappa N, et al. Anti-inflammatory Dietary Inflammatory Index scores are associated with healthier scores on other dietary indices. Nutr Res. 2016;36(3):214-219. 18. Steck SE, Guinter M, Zheng J, Thomson CA. Index-based dietary patterns and colorectal cancer risk: a systematic review. Adv Nutr. 2015;6(6):763-773. 19. Romaguera D, Vergnaud AC, Peeters PH, et al. Is concordance with World Cancer Research Fund/American Institute for Cancer Research guidelines for cancer prevention related to subsequent risk of cancer? Results from the EPIC study. Am J Clin Nutr. 2012;96(1):150-163.